The Computer Guys are an IT management company based in Farmington Hills, MI. With over twenty years of experience, their primary focus is on the medical care industry. The technical demands of practice management software and importance of patient data security mean today’s doctors need professional computer help. We were hired to help launch a new site that would generate leads for their various services. 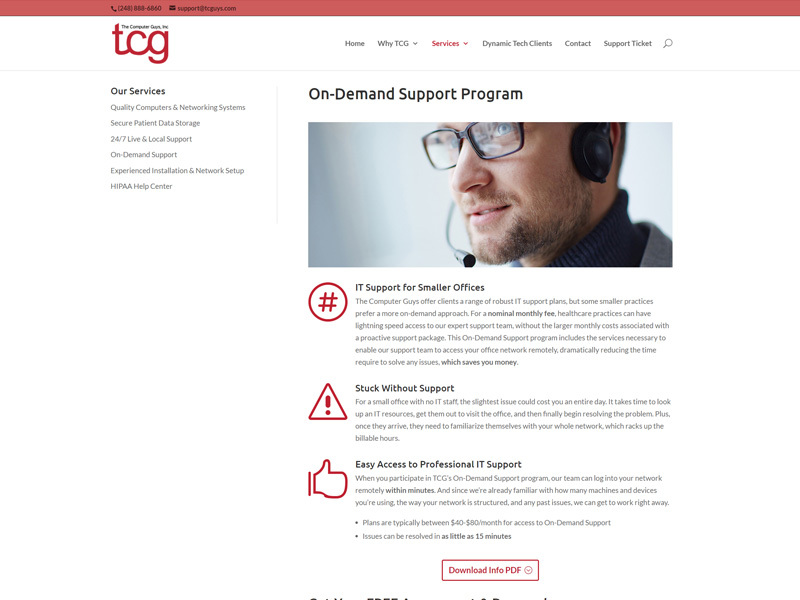 Each service has its own page and is streamlined to provide the essential information along with a strong call to action to fill out the contact form for more information. Inter-site navigation was important to The Computer Guys so that website users could navigate between products to decide which one might be right for them. 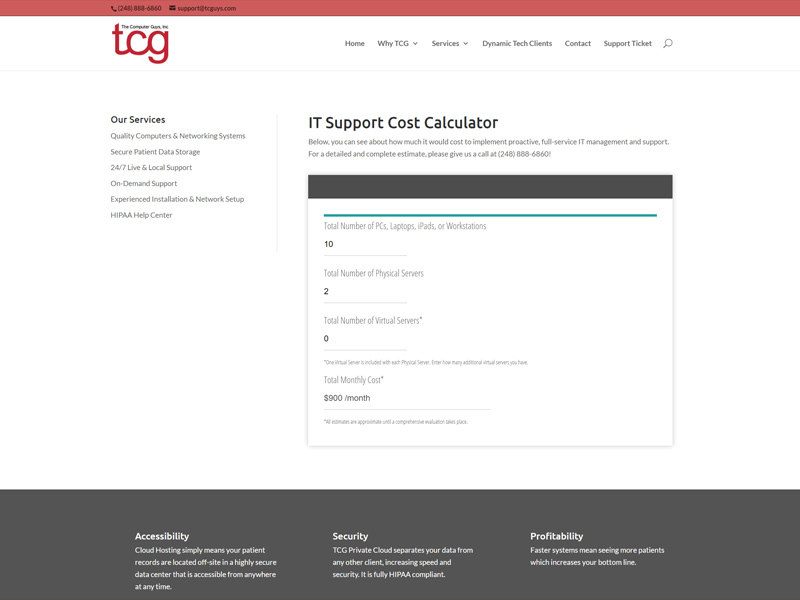 A cost-estimation calculator was also on the requirements list so that prospective clients could see for themselves what kind of savings could be achieved over some of their competitors. Our homepage featured helped to define exactly what The Computer Guys were all about. 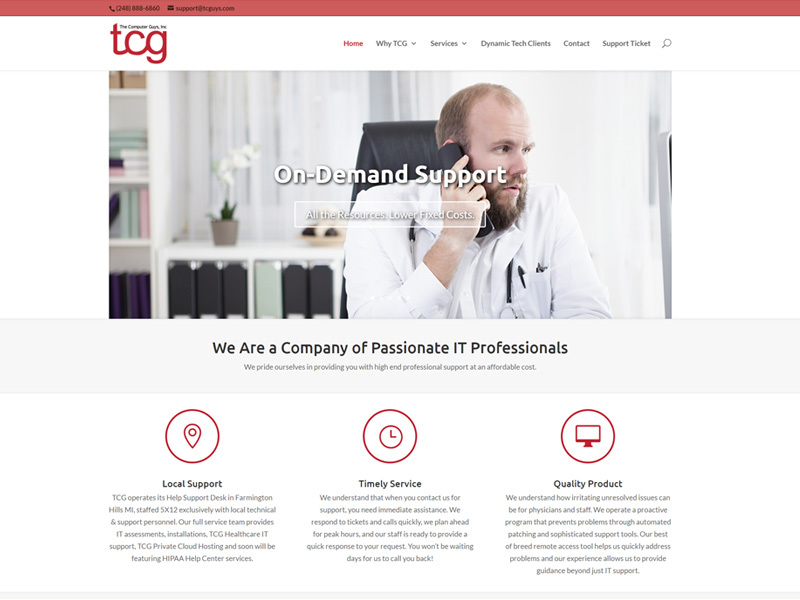 With a rather vague business name, it was important to let people know that they were a local IT support company instead of some other computer-related business. A large slider also helped showcase important messaging for new products or promotional offers. The Computer Guys have 6 core services. Each has its own page, following a common template, with the name, topical image, three to four key selling points, and a call to action paired with a contact form. We also utilized the left bar to help users easily navigate between services. In the medical world, cost is everything. And while IT help is necessary to function effectively, that’s a bill everyone would rather do without. Understanding that their prices were likely to beat their competitors, The Computer Guys wanted a dynamic calculator so that prospective clients could create their own rough estimate before ever calling. Give us a call to get the ball rolling. We’ll talk about your business, requirements, timeline, budget, and everything else necessary to starting building you a polished, professional website. Designed by Corner Store Creative, of course. © Copyright 2017. All rights reserved.